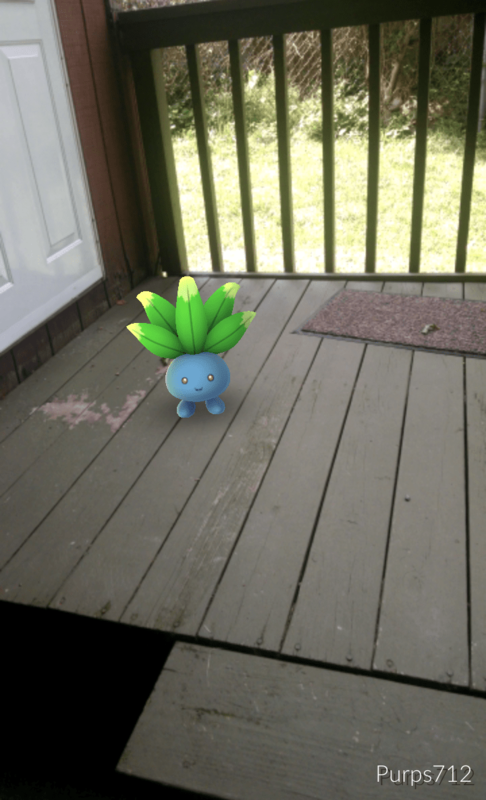 Found an odish on my porch. Last week I picked up my husband on Thursday from work and we went out to eat. He had an app open on his phone as he drove down to the Waterfront, which isn’t super like him. “I’m trying to catch Pokemon.” he said to me. And I accepted it, despite not knowing what it meant. I hadn’t heard about Pokemon Go before it came out. I’m sort of out of the loop that way, but just like everyone else, I’ve fallen into the Pokemon Go trap. To be clear, we don’t catch Pokemon and drive. That’s not a thing. I got sucked into the whole thing last Saturday when Logan wanted to go for a walk. He’d discovered that there was a walking trail somewhere down in the neighborhood that he wanted to check out… because it was a Pokestop. I mean, it’s also a nice walking trail and we’re trying to be more active anyway, but you know. “You could get it [Pokemon Go] too and then we could catch Pokemon together.” So I did, and we did, and it was super hot and awful walking back up all the hills, but we caught a bunch of Pokemon, so that was pretty cool. We then went to a church event where my husband ran around with the other young adult guys present searching for Pokemon. I found a squirtle in the parking lot and came back to tell them where it was. Logan and my sister-in-law’s boyfriend Josh ran over to find it. Did I mention that our church is a Pokestop? So yeah, it’s been a thing for a week now and it’s been everywhere. I already told you about the park on Monday. If it’s not a tragedy on Facebook it’s Pokemon. There’s been a lot of backlash and concern about the game too, but just like anything else, if you use it responsibly it’s fine. Don’t catch Pokemon at work when you’re supposed to be involved in something else and you won’t get fired. Don’t catch Pokemon while your’e driving and you shouldn’t crash. Practice common road safety rules and you shouldn’t get hit by a car. Common sense, people. But no, there’s something new to blame for our short comings and by golly we’re going to blame it! Anyway, from what I understand the game is meant to encourage people to get outside and move around and it has certainly been successful in that. One thing that I like about Pokemon Go is the revelation of parks and things around me that has come with it. Seriously, it’s so hard to find parks on Google. I tried, when we first moved to our current house, to locate parks and stuff around us where maybe we could go run or run to and back or something. We want to have kids in this house someday so finding playgrounds would be good. There’s one not a mile from our house that I had no idea was there. I only found the other one because it has a sign pointing to it from the main road. It’s ridiculous. So there’s a recreational center across the road hiding behind the Dollar General, there’s a park across the street and down a ways, there’s a walking trail 3/4th of a mile behind us, down a giant hill, but still. These are good things to know. So that part’s nice about Pokemon Go. I have to say, it was pretty cool to see all the people outside and hanging out in the park on Monday playing the game. Another cool thing about it is the connections people make when they’re walking around with the game and they find someone else playing the game too and there’s this moment of recognition, this feeling that you’re not alone. We had a couple brief interactions with other Pokemon Go players while we were out. We’re super introverts so they weren’t long or substantial or anything, but it was cool to be able to chat with a stranger briefly and it wasn’t creepy because you were doing the exact same thing. Pokemon Go is a point of connection between nerds who might otherwise never meet. It’s drawing people out and that’s super cool. I will admit, I am almost out of Pokeballs. I have one left and I’ve been taunted by a weedle all last evening. I haven’t opened the game yet today. I will be honest here, it might be enough to get me out of the house today and down the street to the couple of Pokestops near by. Not the walking trail. Not even Pokeballs are worth that hill, but there are a few along the main street and that’s a super easy walk. We’ll see if I can take the taunting of Pokemon in my house without a means of catching them. Besides, I do have eggs to hatch and I could use the exercise. I think I might be going out today. If you’re playing Pokemon Go, be safe out there, guys. And either way, have a lovely day, my friends. I just started playing too. I had a little trouble until I changed a setting on my phone.